Cairo’s taxi drivers on Wednesday repeated their demands to the Egyptian government to immediately ban taxi service operators Uber and Careem. They also called on Egyptian President Abdel-Fattah El-Sisi and Prime Minister Sherif Ismail to interfere to ban the services. An initiative under the name “We’re the real taxi, not the outsiders” was launched at the press conference, with taxi drivers behind the action hopeful that Wednesday’s press conference would be the beginning of a successful campaign. However, many taxi drivers believe that there is an organised campaign by the media and private driver companies to defame them. “There is an organised campaign against us on social media to portray us as horrible drivers who are sexual harassers with rigid taximeters,” Sherif El-Sayed, one of the taxi drivers speaking at the press syndicate said. “We can’t stand this, we can’t stand this, you have robbed us,” taxi drivers chanted. Another taxi driver, Walid Mohamed Sayed, told Ahram Online that he does not refute the fact that there are problematic issues with the behaviour of some taxi drivers. However, Sayed added that he believes that the taxi drivers syndicate and the interior ministry should be the only parties that handle problems between drivers and passengers. “Uber and Careem are both companies that came to Egypt to fool the state and the local taxi drivers… They don’t pay the right taxes, and they’re using the gasoline of the country," Sayed said. 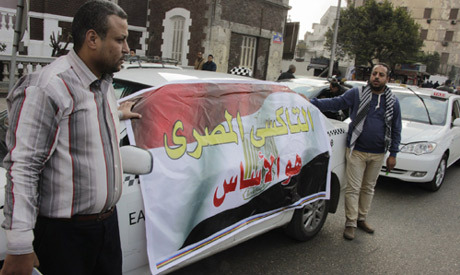 Taxi drivers also argue that they have to pay thousands of Egyptian pounds to obtain a taxi license. Speaking to Ahram Online, Uber Cairo’s Operation Manager Abdellatif Waked said they are not against taxi drivers and that they understand the fact that they might be upset about some aspects of their operations. “Cairo has about 20 million people, the market is large, so it is possible that it can accommodate taxi drivers, Uber, and other competitors,” Waked said. Waked also argued that they’re trying to encourage taxi drivers to join the “Uber platform,” adding that the service is open for negotiations and discussions with taxi drivers to include them in the system. “There are many taxi drivers who have actually joined us as Uber drivers,” Waked elaborated, saying that "the door is always open for more to work with us." Waked said Uber is licensed as a technology company in all the countries it operates in, stressing that they pay taxes and carry commercial registers. Waked also added that the company’s partners – limousine and tourism companies – actually act as offices for anyone who wants to join Uber as a driver, saying these outlets are licensed and have their own commercial registers. Dubai based Careem also insists it is operating legally in Egypt. In a recent interview with Ahram Online, Careem’s General Manager Hadeer Shalaby said they have provided thousands of work opportunities every month to unemployed Egyptians, arguing that their service is not only important for customers, but for their drivers or “captains,” as they prefer to call them. A lawsuit is expected to be filed soon by Egypt’s rights lawyer Khaled Ali, who will be representing taxi drivers against the foreign companies. This is the first time since the applications’ launch in the Middle East that the private services have faced a lawsuit from taxi drivers. The trial comes following a series of protests by taxi drivers in France. The latest outcry by French taxi drivers against Uber came on Tuesday when drivers partially blocked roads on the edge of Paris and other areas to protest against what they say is unfair competition from such companies. Uber is owned by white men, under white property laws. Do you think this white culture is of any interest to the region. It is not. We need laws to prevent bigotry towards workers. Laws that prevent that uber dominates the market because the state favors its competitiveness. We need laws that will limit uber to compete freely with other companies. This free competition has rules, those rules are set by the laws, and those laws should reflect the equality of all subjects through liberty. If bigotry is shown by uber then the taxi driver has the right to a free discussion with their government representatives to understand the interests in both parties. The resolve should always level the playing field in favor to those with less liberty and increase their freedom to compete. Egyptian taxi drivers don't mind stealing from their passengers with rigged meters.... and now have the cheek to bring a court case... and why??? BECAUSE THEY WANT TO CONTINUE STEALING FROM PEOPLE!!! The simple truth is, people want to use clean cars, people want to feel safe, people want to pay the honest fare, people want a driver that will speak and deal with them in a good way.... and Egyptian taxi drivers do not offer any of these!